Cacao beans (Theobroma cacao) are a good source of calcium, iron, zinc, copper, manganese, and potassium, as well as Vitamins A, B1, B2, B3, C, E, and pantothenic acid. They contain several compounds which stimulate the production of dopamine in the body and potent mood enhancers which can encourage an overall sense of wellbeing. 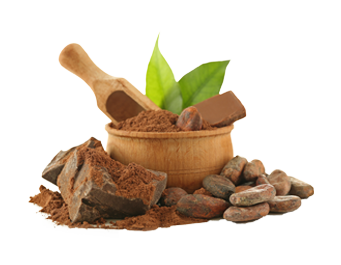 Cacao in its raw state is remarkably rich in magnesium and a good source of sulfur. It also contains high amounts of protective antioxidant compounds, such as polyphenols and flavonoids, which can be beneficial to heart health and may help maintain healthy cholesterol levels.